Disclaimer: The House-Tree-Person Art Therapy Activity is only to be used by a mental health professional. See the directions for House-Tree-Person Drawing Therapy Technique link at the bottom of the page. Basically, the house is the sense of self and the ego of the client. Look at the size of the house. Is the house big (Possibly a very controlled atmosphere or large ego)? Is the house small (Low self-esteem or complete rejection of the home life)? Where is it located on the paper (Center, upper corners, or lower corners)? Is the house grounded, or is it floating? What is the atmosphere of the drawing overall? Does the house look warm and inviting? Or, does the house look cold and ostentations. The lines of the house can also tell a lot about the client / artist’s ego strength and the way they set boundaries. Heavy lines indicate too much ego, and thin lines equal a weaker ego. The lines can also indicate how the client / artist set boundaries around their phenomenological world. Is there a welcoming walkway? This lets the therapist know how the client interacts with the world around them. The walkway tells the therapist how people are allowed in. Is the walk way long? Short? Wide? Look at the different scenarios to see how the client allows others to come into their world. Are there windows and doors? Windows and doors suggest that the client / artist is open and accessible to the world. A lack of windows and door suggest the person is withdrawn and not very open to the world. If the client draws too many windows and doors this can indicate that they are very “needy” and dependent on others. The roof can represent the client’s religious, intellectual, or private fantasy world. The chimney can mean several things. It can mean how warm and open you are as a person. This might also represent the "father image". Smoke from the chimney can mean that the father figure was warm and kind, or that there is anxiety present. If there is too much smoke it might mean there is hostility and too much masculine energy. If there is no chimney drawn it may signify that the person’s home life, or ego, lacks warmth and compassion. The tree’s trunk is the client’s ego, self, and basic personality. The limbs on the tree are the way the client reaches out to the world. If the branches are little, there is the possibility of an introvert personality. If the branches are too large it could indicate neediness. Bare branches can indicate depression and hopelessness. Leaves from the tree mean that we are being well fed from these relationships (think of how the leaves make food for the tree by photosynthesis.). The roots from the tree represent how grounded in reality a person is. Where is the person in the drawing? What is the size of the person in the drawing? 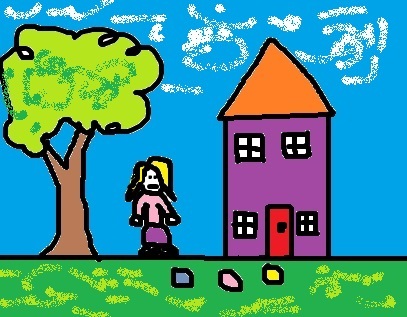 The size of the person in the drawing is related to the person’s self-esteem and self-concept. A smaller person may mean low self-esteem, depression, and lack of energy. An average size person may mean a healthy self-esteem. A larger person in relation to the house and tree might mean an inflated ego and delusions of grandeur. Is it close to the house or tree? What are the arms doing ( Reaching out, or defensively closed)? Are the hands drawn? Pointed fingers often mean aggression is present, while mitten hands may mean anxiety is present. The legs are similar to the tree roots and represent how grounded a person may be. Small feet can possibly mean insecurity in a person. Look at how the mouth is drawn. This is similar to the leaves on the tree as it is how we get fed (foods, needs, etc.). Teeth can mean aggression if they are drawn. They often say the eyes are the mirror to the soul.